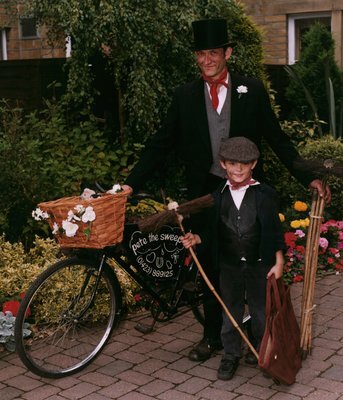 | Lucky Chimney Sweep for Weddings! A tradition going back over 200 years - a handshake for the groom and a lucky kiss for the bride. It is a long held tradition across Europe that chimney sweeps bring good luck. Most famously, some 200 years ago King George II was riding his horse in a royal procession when without warning a stray dog began nipping the legs of the king’s horse causing it to rear up and the king to lose control. As the crowd looked on in horror, a chimney sweep came from the crowd, regained control of the horse and returned to the crowd as quickly as he had arrived. After the procession the king was unable to thank the sweep personally for his bravery, so he decreed that from that day forward all chimney sweeps are bearers of good luck and should be treated with respect. 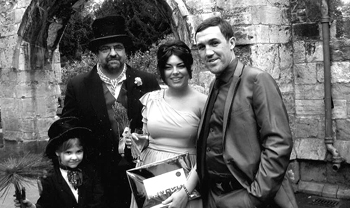 To this day chimney sweeps are still invited to attend special events to ensure good luck. As far as the tradition of sweeps bestowing a marriage with luck is concerned, it is on record that before the Duke of Edinburgh married the Queen in 1947 he slipped out of his apartment to shake hands with a sweep who just happened to be passing by! Lucky Sweep service is available up to 40 miles from Harrogate, North Yorkshire, please enquire using the form below. "they both made a wonderful day extra special, thanks to all"
wedding sweep service is available up-to 40 miles from Harrogate North Yorkshire. 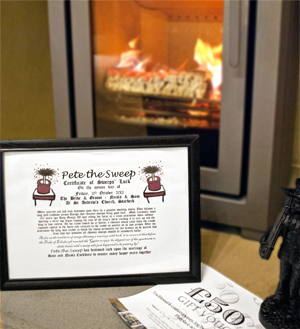 Many thanks, Pete the Sweep. 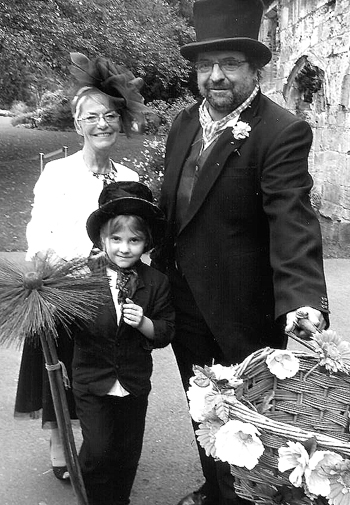 If you are enquiring about our Lucky Chimney Sweep wedding service please allow a minimum of 48hrs for bookings, we can usually attend most weddings within 40 miles of Harrogate North Yorkshire. "Just to say Thank you for the terrific log burner. Looks fantastic, easy to use & we love it."